I got asked by one of the show runners to plan a bit and ultimately that led to me emailing him, "Hey, on a scale of "THIS IS THE BEST IDEA EVER!" to "what are you thinking you crazy person?" 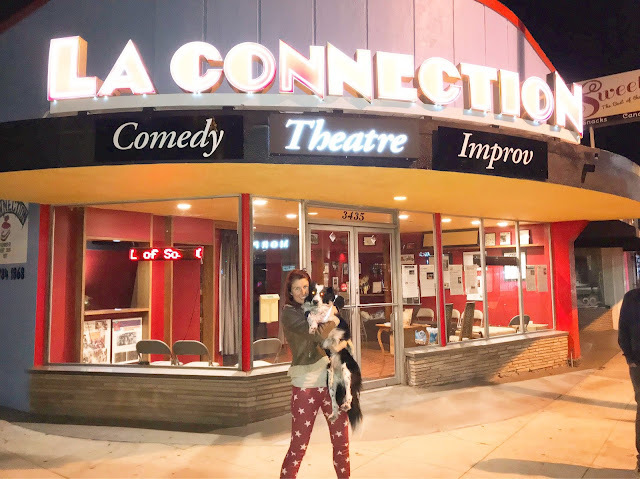 can I bring my dog up on stage with me?" The answer was closer to the former. 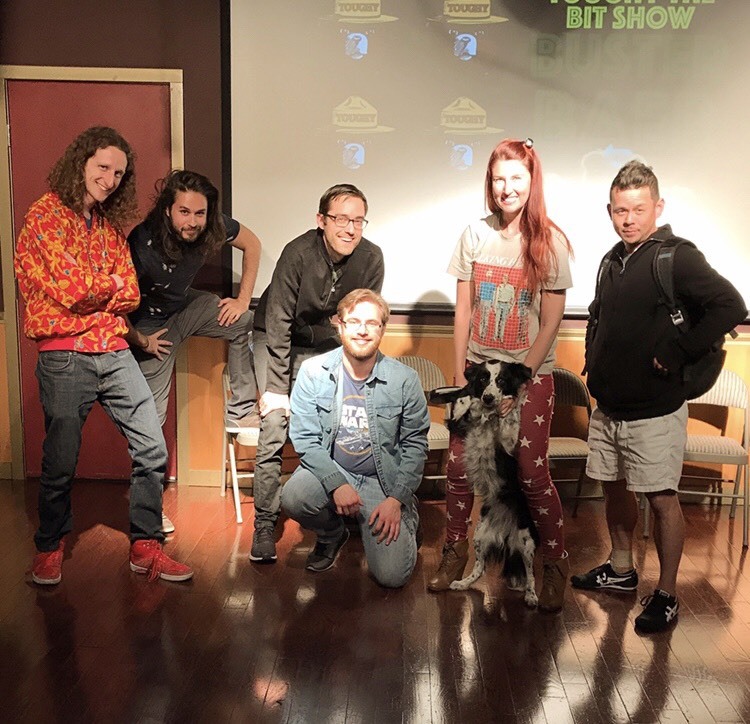 Humans who say yes to doing improv with a dog: (L to R) Theo Manhattan, Blayn Barbosa, Gabe Durham, Cody Shampine, me and Lucy, and Joshua Han. Usually I don't film improv sets because they're awkward online as there's a tension in real life that makes stuff funny or watchable whereas online it falls flat and seems clunky. But dog improv was too good to pass up. 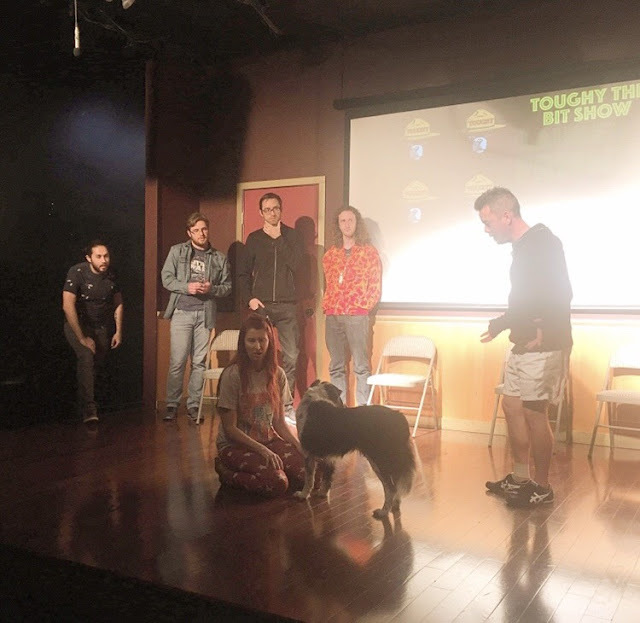 I only preface this since everyone on my team is very funny and talented but we had our moments of silence trying to figure out what to do (we threw out the suggestion, "milk bone" because we wanted to ignore the fact that there was a dog on stage). How did the dog like it? Honestly, she had NO idea she was on stage. She thought we just got up from our seats to be in an oddly lit space instead. Lucy knew everyone on stage and has cuddled with everyone on the couch at some point, so I'm pretty sure she thought it was a cool hang with oohs, ahs, laughs, and weird clapping noises as a bizarre soundtrack. I often put TV on for my dogs when I leave the house to drown out white noise and ease their stress, so maybe she thought she was in a Friends or Brady Bunch episode? Gabe is tall and needed eye contact. Life is hard, especially this past year. This industry can be challenging because everyone is so talented and it can take forever to get traction. I happily work hard every day. But it was extra fun to get to do something a little more alt comedy that would not fly at a normal show. Thanks, Toughy the Bear! 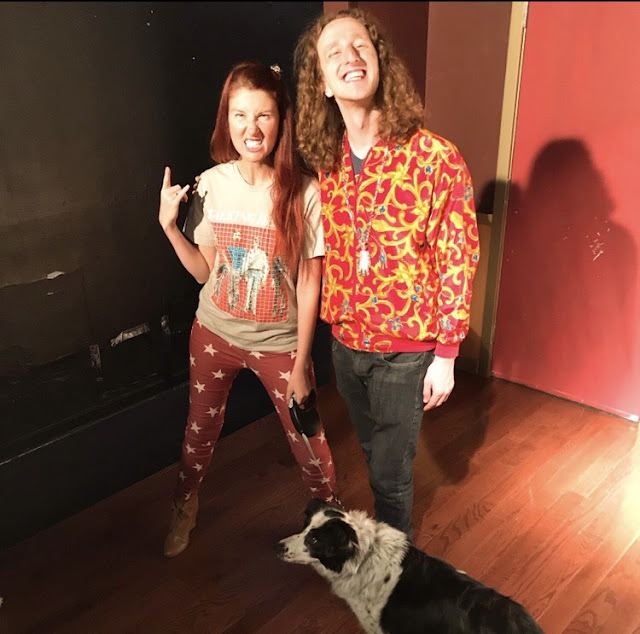 Up on deck are some more comedy posts, posts about grief, and even some more outfit posts! I'm trying HARD to get back into that blogging life y'all. Check back here or follow me on social media to not miss any updates, as well as to see all of the fun nonsense that is my life in comedy! It's so great to see you back in the blogging world, Lauren! 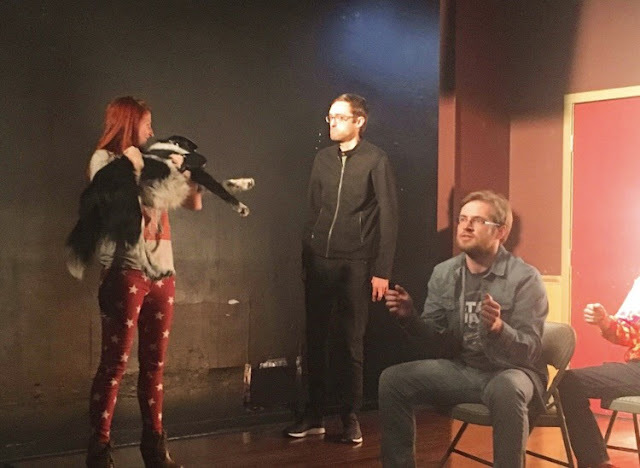 This is BEYOND awesome you included your pup in your improv show, haha. I love it! She really didn't seem to mind being on stage at all. Looking forward to your future posts! Side note - I just finished reading "My Squirrel Days" and couldn't help thinking of you. Hope all is well in LA!